Matriculation or equivalent and Diploma in Electrical/ Mechanical/Electronics and Telecommunication (Radio/Power) Engineering approved by All India Council of Technical Education (AICTE) with 60% in aggregate (5 % relaxation in above minimum cut off will be given for SC/ST candidates and outstanding sports person of National level who have obtained 1st, 2nd or 3rd position in any field sports events at the Open National Championship/ Interstate National Championship. 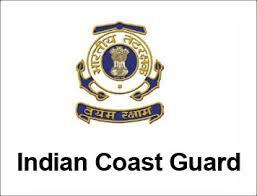 This relaxation will also be applicable to the wards of Coast Guard uniform personnel deceased while in service). (i) Select the advertisement for Yantrik 01/2019 Batch (Diploma in Electrical/ Mechanical / Electronics and Telecommunication Engineering). (ii) Select the post applied from any one of the following: - (aa) Yantrik Technical (Mechanical). (ab) Yantrik Technical (Electrical). (ac) Yantrik Technical (Electronics and Telecommunication). (iv) Proceed to fill up the application (All Star (*) marked entries are mandatory and to be filled). (v) The name of the candidate, father/mother's name and date of birth should be mentioned as per the 10th class certificate. (vi) Indicate exact percentage of marks in diploma up to two decimals and this is not to be rounded off. (vii) Filling up of information like personal e-mail ID and Mobile number of the candidate are compulsory. (viii) Candidates to choose any one Centre out of the options displayed. (ix) On completion of filling application, check your filled details once again prior clicking on the submit button.